If Eckhart Tolle and Jim Carrey had a baby, that baby would be Kyle Cease. 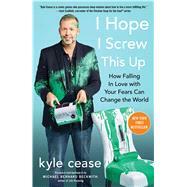 After twenty-five years of achieving what he thought were his dreams of being a headlining touring comedian and actor, Kyle Cease suddenly discovered that the belief that “When something happens, I will be happy” is a complete lie. With nothing more than an intuition, he decided to quit his stand-up career at its peak, and now—as a transformational comedian, he brings his one-of-a-kind self-help wisdom to sold-out audiences in his Evolving Out Loud Live stage show. In I Hope I Screw This Up, he disarms readers as he leads them to their own personal breakthroughs, helping them to recognize that actual happiness and fulfillment is available to them—not in some distant future, but right now. As he has shown audiences all over the world, when you embrace your pain, fear, and vulnerability instead of pushing it away, you will discover an authentic creativity and power that is truly unstoppable. Using self-deprecating personal stories, hilarious observations on life, and poorly drawn illustrations, Kyle unravels the deepest issues standing between us and emotional freedom. From discovering the never-ending opportunities that come from playing—and going with whatever comes up in the moment—to learning to let go of what feels heavy in our lives, this book is a journey into the endless possibility that can appear if we just dare to let go of our fear of screwing up.